…you’ll notice two rather distinctive voices taking turns [in this book]… One voice will sound more like that of a pastor; the other, a college professor. And we don’t necessarily agree on every point. But every chapter reflects months and years of conversations between us, and hopefully you’ll hear us continuing to speak with each other across these pages. Sign up for a day using this Google Sheet. Mark and I will each take two or three turns; otherwise, we’d like to leave plenty of space for readers to contribute. I’ll reserve the right to do some editing, but basically, all you need to do is follow the guidelines in this document, which includes a sample reflection from me to give you a sense of the style, tone, format, etc. Email me your 200-word devotion no later than January 19th. 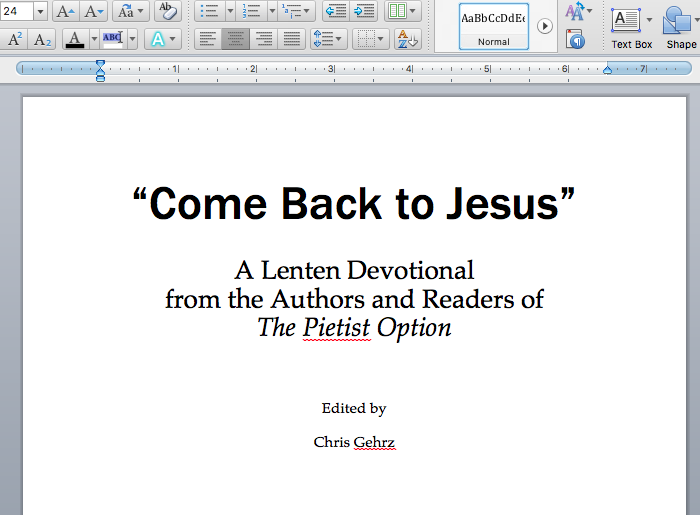 Help us to publicize the finished devotional once it’s ready. We’re going to publish the devotional as a PDF (a free one: so I’m afraid we can only offer our gratitude, in lieu of financial compensation), in order to make it easy to share with friends and family — or even to recommend it for your congregation. I’ll post it here in late January or early February, and reprint daily devotions through my Facebook page and Twitter feed.